Last October we brought young Oscar to our home in L.A. From a scared, insecure dog, he slowly changed into an amazing companion, sweet, playful, obedient, and with more energy than the Energizer Bunny on caffeine. That energy poses a small problem: Chief, our aging Jack Russell, simply cannot keep up with him. We discussed the possibility of getting a third, young dog to be playmate with Oscar. It happened a little sooner than we thought. 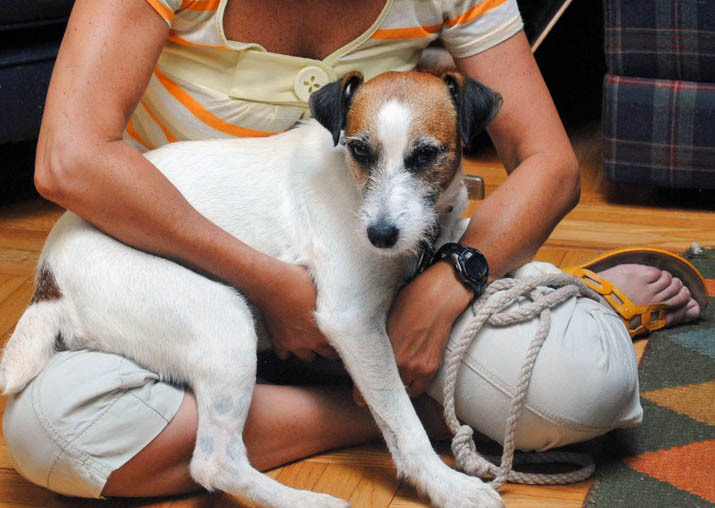 Meet Bucky, a 4 year old Jack Russell with a lot of personality, but quite a bit of sweetness mixed in. Buck is another rescue dog, who was living under pretty bad conditions, kept outside without much human contact or affection. We thought he was a different type of Jack Russel, with a tan color, but after his first bath, we discovered he is in fact snowy white, and the previous “color” was just Oklahoman dirt ingrained in his fur for years! Because he had never been inside a home, he was afraid of everything: doors, appliances noises, TV, but got better each day. We’ve had him for almost 3 months now, but unfortunately the journey has not been bump-free. Chief won’t accept the newcomer, and we’ve had to deal with some intense fighting, some quite scary. Do you think I look like my brother Chief? Well, that’s because we are half brothers, same Mom, different Dad! But, bring on a hose into the equation, and off he goes! How could we possibly let this dog find another loving home? No way! Welcome Bucky! What a cute dog! You’re a wonderful person to make room in your home for an abused or neglected dog. I think pet companions teach us so much about ourselves. We are still amazed to realize that even though Buck is 4 years old, when we got him he was shorter than Chief, we thought he was a short-legged JR, but now he caught up with Chief in size, is threatening to pass him, AND he’s got LONG legs! THe poor boy was so mistreated that he did not fully develop until now! Bucky is beautiful! I hope things get easier with Chief, that has to be frustrating. 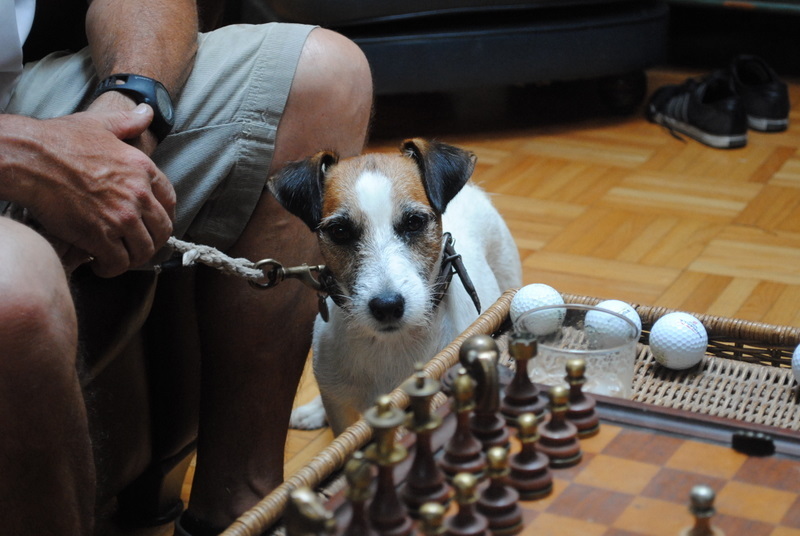 I think Bucky wants to play chess – he’s looking pretty intently at those pieces! What a face!! He is so cute…I boggles my ind the things that people can do to horses, dogs, and cats. How can anyone want a person i their lives, who abuses animals!? What a sweetheart. I hate hearing how some people treat dogs. Just terrible. Glad he has a happy home. He is a happy dog now, that’s for sure. He never barks, which worries me a little, he did bark the first few days, then stopped. 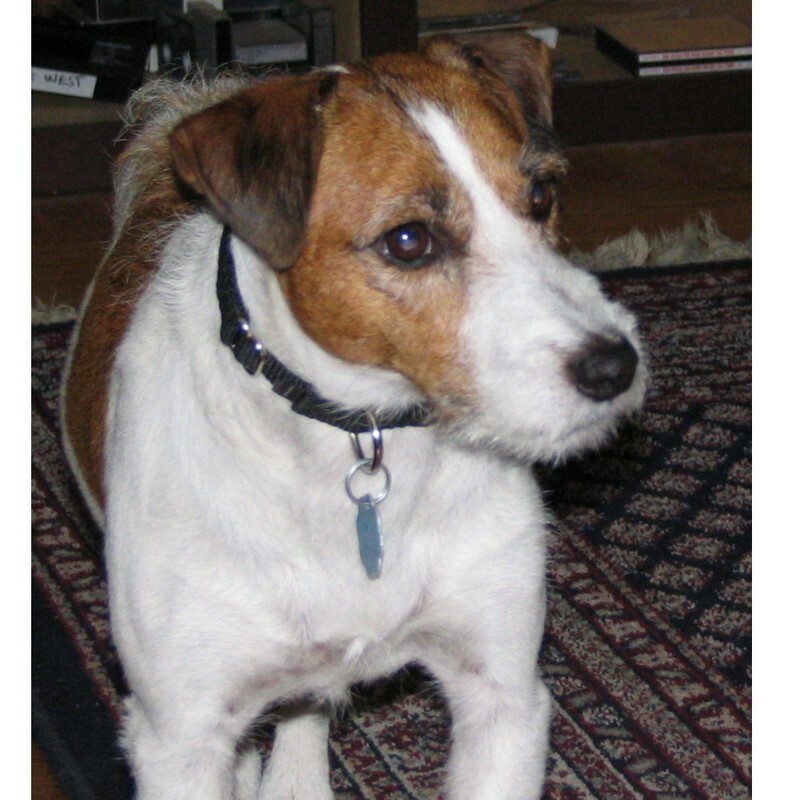 I justl adore Jack Russells (is that 1 l or 2?) and you two are such marshmallows!! These dog posts are literally killing me… my heart… they are without a doubt, my favourite posts. Buck is a fantastic addition to the family; so, so, cuuuute. I could only wish to get as much exercise in a week as he gets in 2 minutes with that hose. Did you see him go? He looks so much like his brother Chief; it must make you smile. How is Oscar enjoying Buck? So wonderful that these dogs have found a loving home; that makes me smile! Thank you for this post Sally. Oscar and Buck are best buddies! I wish we could make a video of them patrolling the fence, it is hilarious. If a squirrel DARES walking on top of the fence, they go absolutely nuts, Buck jumps so high to try and catch him, and Oscar goes right behind, barking furiously – they circle them around trees, it’s a party out there… it’s so sad that Chief doesn’t participate, but the truth is that he doesn’t have the energy for it anymore, at 12.5 years of age. Sally, muita admiração por voce, que adota esses cães! Sou uma cat person por puro comodismo, mas um dia tenho certeza que terei um [ou dois, ou tres] cachorro. Cachorro da’ muito mais trabalho do que gato, nao haja duvidas, mas sao bichinhos tao incriveis! Eu, se pudesse, teria cachorro, gato, coelho, galinhas… mas, seria muito complicado no momento. Quem sabe um dia, ne’? Hum…a calm JR! That’s about as rare as the beautiful little Schnauzer we just adopted who rarely barks! She has been a challenge too, since she was not housebroken as claimed, but we are determined to make it work. Our 12 year old Schnauzer, (another rescue) Billy, can’t keep up with her either, but they are seldom very far apart. Luckily, he tolerates her very well, except when it comes to wrestling, and he has to remind her quite frequently that he’s no longer up to that kind of activity. Best of luck. He’s a handsome animal.